The April 17 tax deadline is looming. As the mad dash to file draws nears, there is some new technology to help make this potentially stressful task incredibly simple — yes, even for those filing at the last minute. 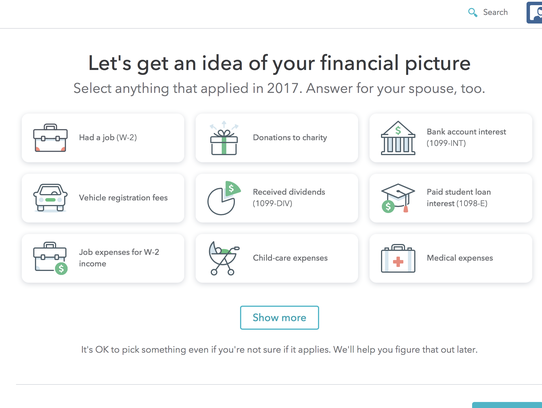 If you made less than $66,000 in 2017 and have a simple return, the government makes it easy to file online, for free. The Internal Revenue Service’s “Free File” preparation and filing software guides you through the process. You can sign your return electronically and track the progress of your refund, all for no cost. According to the IRS, 70% of all taxpayers — about 100 million people — are eligible to file using the Free File program. Other tax-prep companies such as H&R Block, TaxAct and TurboTax are jumping in with free filing options, as well, that can be used by those filing forms 1040EZ or 1040A. The IRS makes filing a plain-old 1040 online pretty darn easy. But there are plenty of people with much more complicated tax situations. I’m a self-employed, married freelancer who owns her own company and has a child — which is to say my tax situation is complicated. In the past, I’ve had to decide between tackling my taxes with the help of tax prep software or seeing an accountant in person (which typically costs me more than $1,000). 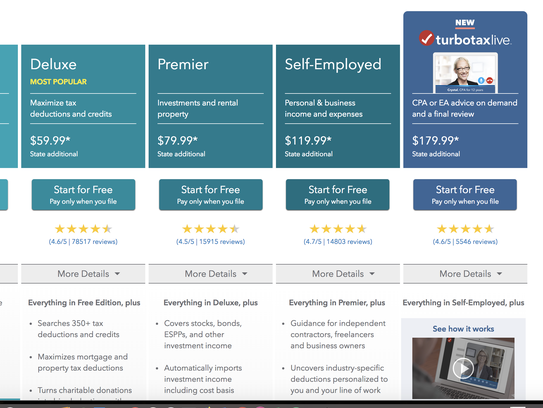 This year, however, new tech from TurboTax promises the best of both with a new service called TurboTax Live. I fired up my laptop, pulled up digital copies of my 1099s and PDF files of my last two years of taxes, logged in to TurboTax and choose the Live option for $179.99. From there, I answered a bunch of simple questions, similar to taking an online quiz, and the software tracked my progress. It was actually kind of fun. When I finished everything I could do on my own, I still had several questions. So I clicked the blue “Expert Help” button to get connected with a pro. In minutes, Jake Bakke, a CPA with his own private practice in Wheat Ridge, Colo., popped up in a one-way video call (I could see him, he couldn’t see me). He asked me a handful of questions to get a better idea of what my overall tax situation was and then guided me through all the confusing bits. Bakke took charge and helped me make sense of my expenses, telling me what was OK to write off and what isn’t. He even mentioned that the fee I was paying for his help was deductible. I could see everything he was doing, but he let me know that TurboTax carefully controls his view of my information. “Your Social Security number, your date of birth, all that stuff is blocked on my side of the screen,” Bakke told me. TurboTax spokesperson and resident Certified Public Accountant Lisa Greene-Lewis said all TurboTax Live experts are CPAs or Enrolled Agents, with an average of 10 years of tax-preparation experience each. The pros are available during business hours, on demand, seven days a week. Their role is to give personalized tax advice and answers to specific tax questions, as often as needed. My call with Bakke lasted about 45 minutes, and when it was done, so was I — with my taxes for another year. And this time I feel confident that I did them right. The entire experience was incredibly comfortable, and I’ve already recommended it to several friends. Taxes can be complicated and confusing, so there are a couple of apps that I keep loaded on my mobile devices to make everything easier. 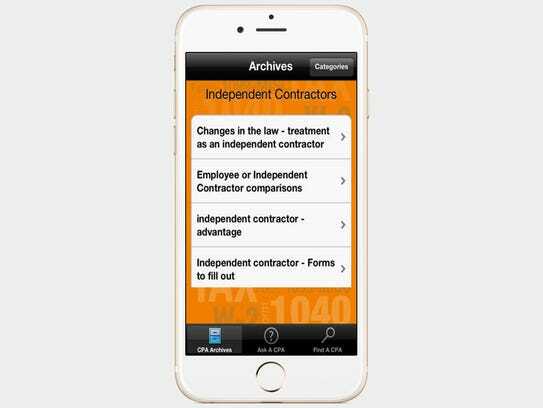 One is Ask A CPA (Free, iOS, Android), which has a vast collection of questions and answers about filing returns. It breaks everything down in a simple way, and if I have a problem that isn’t already addressed in the app, it lets me send my query to a CPA in my area. For tracking donations and the deductions that go along with them, I love ItsDeductible (iOS). If you regularly drop things off at the local Goodwill or donate to charity, just log it into this app, and it’ll tell you how much you can deduct from your taxes. You wouldn’t expect the federal government to be on the cutting edge of tech tools, but when it comes to tracking your refund, there’s an app for that too! IRS2Go (Free, iOS, Android), is the official mobile app for monitoring your refund and making payments if you owe back taxes.